Well, it's done! 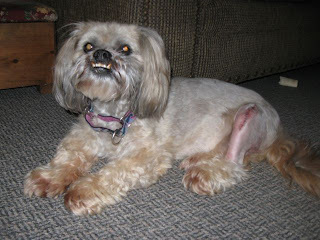 On Wednesday, July 21, 2010, Oscar underwent a cruciate repair surgery on his rear left leg, along with dentistry. He came out of it with flying colours! It was a very routine surgical repair, and the dental resulted in no extractions - everything was very healthy. I picked Oscar up after supper around 7 p.m. and after paying the bill (aka the bathroom that won't get done this year), Oscar led the way out of the back area, sporting a very spiffy lime-green bandage. He was very glad to get back home again! Last night (Thursday, July 22), his lower leg/foot was quite swollen; about 2 times the size in fact. I was very concern because obviously the bandage is now too tight. I made a couple of snips in the bandage around the foot to help give some relief and a while later there seemed to be SOME improvement. Not quite enough to alleviate my worry. This morning, his foot was about the same, so a return visit to the vet was made first thing. They agreed that the bandage needed to be removed and in fact, should come off today anyway. 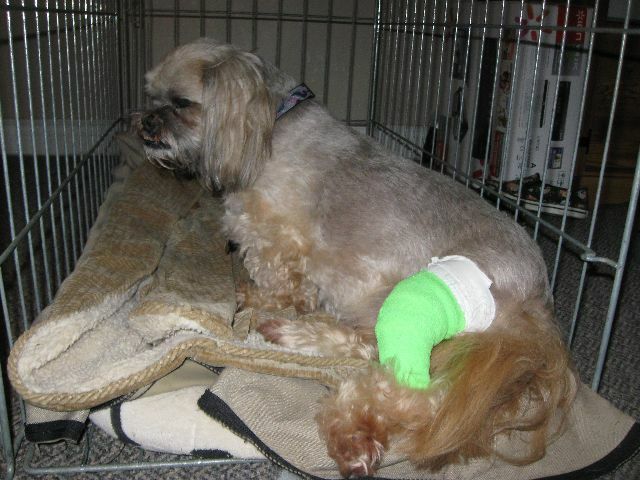 As well, he was treated with 3 sessions of therapeutic laser, with the next session booked for Tuesday. And here is a photo of his leg, with 11 stitches. It doesn't appear to be bothering him too much, although there was a point where he was licking it a fair bit. If that continues, he'll be wearing an e-collar! Poor little guy! 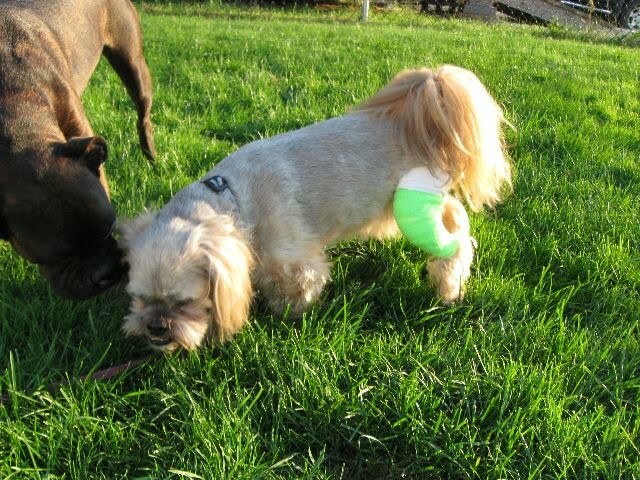 So glad everything went so well...and his leg looks great! Here's wishing him a speedy recovery!